GrandMeister goes wireless – introducing the WMI-1 MIDI interface! You asked for it, so here it is: introducing the WMI-1, a bidirectional, wireless MIDI interface optimized for use with the GrandMeister 36 and the matching GrandMeister remote app for iPad! 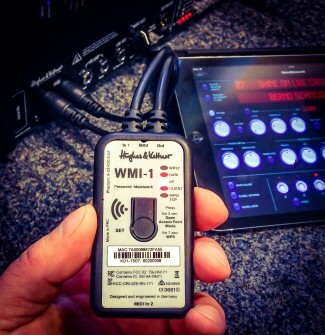 The WMI-1 can serve as an access point for stages and rehearsal rooms where Wi-Fi is not available, or as a client connected to a router in a network, such as a home network. The GrandMeister’s MIDI port provides phantom power to the WMI-1, so it does not need an outboard power supply or battery. So there it is. The WMI-1 offers an additional MIDI input that merges the commands from the iPad and from a MIDI foot controller. To use the WMI-1, all you need to do is select the WMI-1 as a Wi-Fi network in the Wi-Fi settings of your iPad, or connect it to your home network using the WPS function. Both the necessary apps – GM36Remote and WMI Connect – are freely available from the Apple App Store and work with any iPad with iOS 7 or later.